A need to solve an overcrowding problem at a Pflugerville, Texas, high school has led to a first for this Austin suburb. 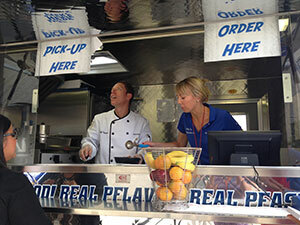 Aramark, foodservice partner for the Pflugerville Independent School District, has opened the first food trailer in town. The Talon Taco Co. opened recently at 2,800-student Hendrickson High School, one of three high schools in the 29-school district. The trailer serves street tacos, made-to-order burritos and bowl meals, and orders and sales are tracked through a wireless POS system. All meals fall under the parameters of USDA-approved reimbursable meals. Geoff Holle, foodservice manager for Aramark at the district, says the truck is serving as many as 300 meals a day, at a full-meal cost of $2.95. “The students have chits that they fill out, where they select their protein—carnitas, shredded beef or chicken—and then choose from different vegetables and flavor-infused rices such as cilantro-lime. They can also do vegetarian,” says Holle. The idea was conceived when district officials came to Holle in June, looking for a solution to overcrowding at Hendrickson. The district is planning for a fourth high school, but Pflugerville’s problem was more immediate. The idea of a food truck seemed like a no-brainer to Holle. Administrators loved the food trailer idea, and Talon Taco Co.—the high school’s sports teams are the Hawks—was born. Holle worked with administrators, faculty, students and even city officials to collaborate on the final concept. The trailer is situated right outside the cafeteria, less than 100 feet from the indoor server. There are 22 cafeteria tables outside for al fresco dining, and Holle says there are plans over the Christmas holiday break to put a cover over the seating area and add the ability to install heaters and cooling units, depending on the season. He adds that the Talon Taco Co. has attracted more students to the cafeteria, which has resulted in a small bump in overall business on the open campus. Another benefit of the Talon Taco Co. will be realized this summer, when Holle plans to use the vehicle for Pflugerville’s summer feeding program.